You want a challenge? Try getting a decent handle on Mormon theology today. The gospel of Christ is supposed to be simple enough for any of us to understand as long as we are willing to put in a bit of effort. Why then do we have such trouble separating the pure teachings of our religion (those that come from the revealed word of God) from later collections of rumors, myths, opinions, and speculation? This is a thin volume consisting of only three short chapters and an epilogue. It takes up all of 178 pages, yet it's packed with more valuable information than anything in memory. A book this short I could usually finish in an hour or two, but I kept finding myself stopping to think long and hard about what I was learning. This is the kind of book that will have you exclaiming, "Whoa, Dude!" and staring off into space while you let what you just learned try to wrap itself around your brain. I was only part way through the first chapter when I realized this was the most amazing book on Mormon theology I had ever read in my life. And I am not exaggerating. I was 21 years old before I bothered to read the Book of Mormon straight through (I went on my mission when I was nearly 22), and I think the only reason I was finally getting around to it then was because I found an 1830 replica edition at Deseret Book for 30 dollars and thought it looked and felt kinda cool. So I started in reading, and found that narrative version more readable than my modern seminary edition that was all broken up by verse. But you can imagine my confusion when the original translation seemed to contradict what I had learned growing up in the church. God the Father did not sacrifice himself, I had been taught. He sent his son Jesus to perform that mission. "And he said unto me: Behold, the virgin whom thou seest is the mother of the Son of God, after the manner of the flesh." "And the angel said unto me: Behold the Lamb of God, yea, even the Son of the Eternal Father! . . . "
" . . . And I looked and beheld the Lamb of God, that he was taken by the people; yea, the Son of the everlasting God was judged of the world . . . "
" . . . and shall make known to all kindreds, tongues, and people that the Lamb of God is the Son of the Eternal Father, and the Savior of the World..."
I continued to believe what I was taught at church, though it didn't sit well with me, and not just because my teachers contradicted the scriptures. It didn't sit well with me because it didn't seem to me like much of a sacrifice for an all-powerful God to send his Son (who, let's be honest, we consider to be a personage of lesser rank than the father) to be killed in his place, even if the Son was willing. "On the nature of God there is, perhaps, no more concise or confusing statement in the Mormon canon. These verses present Jesus Christ as God, a single being who is both the Father and Son -the Son because of the flesh and the Father because he was 'conceived by the power of God.' If the phrase 'conceived by the power of God' means only that Christ was conceived in the flesh by and with godly powers, it does not explain how Christ is the Father. If, however, the phrase means that Christ as the Father was conceived by no power outside his own, then this verse tells us that Christ as Father had no progenitor, but was the uncreated and pre-existed creation as the self-existent divine Supreme Being." Are you lost yet? Don't be. Toscano provides a complete explanation of how and why this seeming dichotomy can exist and still make sense. And he doesn't just pull the explanation out of thin air, either. Joseph Smith tried to teach these things to the people in the months prior to his death, and we have numerous instances where he lamented the Saint's inability to comprehend such wonderful concepts. Toscano provides us with the prophet's own words as he tried get the Saints to understand the mysteries of godliness. "Joseph Smith's godhead statements, which by his death achieved the intricacy of an invention by J.S. Bach, were reduced by the 20th century LDS Church to the simplicity of a Lawrence Welk polka." More important than the how of the condescension of God, is the why. This is covered in chapters two and three of Toscano's book, where the endowment ceremony is discussed and explained in detail. I should note here that many members feel that a discussion of any part of the temple ceremony outside those walls is strictly forbidden, but that isn't so. It is only in three short places that we covenant to secrecy at all, and as will be shown below, it is quite doubtful that Joseph Smith ever intended for any of the ritual to be so secret. It's unfortunate that so many assume nothing at all is up for discussion. Perhaps this reluctance to talk about the meaning of this important ordinance is the very reason we understand so little about the things God would have us know. Nevertheless, I'm not going to go into any of that, except to point out that the overriding message of the temple is that the Eternal God, (Jesus Christ, Jehovah, the Supreme Being), being so filled with infinite love for his creations,chose not to remain on his throne and lord it over the rest of us, but instead to join us, to become one with us, to make us all His equals. "The endowment presents the Garden of Eden as the symbolic place where the Gods descend into mortality. This condescension is referred to in 1 Nephi 11 of the Book of Mormon, where the text presents an angel who asks Nephi, "knowest thou the condescension of God?" When Nephi answers no, the angel opens to him a vision of the virgin Mary, the mortal portal through which the male aspect of Jehovah is incarnated as the mortal Jesus." "The condescension of Jehovah is not a show or sham. It is not temporary. It is permanent. God becomes one with the angels, and the angels become one with God." The endowment, when properly performed and understood, is symbolic of God's infinite, unrestricted, and unconditional love for his children. "It is subverted by competing similar rituals of both Masonry and Wicca. It is obscured by the temple narrative itself. It is distorted by placing women in subjugation to their husbands, by allowing a husband to play the Lord to his wife prior to their being sealed in marriage. It is distorted by the relentless emphasis on obedience, by the oaths of secrecy, by the former connection of the penalties with threats of punishment and revenge. These distortions resulted in part from Brigham Young's narrative of retribution, his desire to punish apostates, his insistence on avenging the murders of the prophet and patriarch, and his objective of preventing with threats further betrayals of the Saints by members of the LDS Church." "In December of 1845, the meetings of the Quorum of the Anointed were suspended and thenceforth women were prohibited from participation in the theocratic activities of the church. This act constituted the first death blow to Joseph Smith's revelation of Messianic priesthood fullness." "The Second blow to priesthood fulness and the Holy Order also occurred in December of 1845, when the language of the second anointing was changed so that women were no longer anointed 'priestesses unto God,' but rather 'priestesses unto their husbands.' During Joseph Smith's lifetime, beginning with the second anointing of the first female, women had been anointed priestesses and men had been anointed priests unto God." "The Third blow to priesthood fulness and the priesthood order was dealt by Brigham Young when he suspended for 23 years the meetings and operation of the Relief Society, an institution intended by Joseph Smith to serve as a female priesthood organization, a 'kingdom of priestesses.' Eventually, the Relief Society was reconstituted, but not as an organization of female priests. It was organized as an independent women's organization. It's worth remembering that Brigham Young had never been ordained of God. He had no authority to change the everlasting ordinances that the prophet Joseph had put in place. He did not even claim the mantle of the Prophet, but saw himself as placeholder until Joseph's son came of age to take the reins of the church. Still, it didn't seem to bother him to undo Joseph's sacred work. As depressing as it is to see how bad things have gotten, I'm convinced it's not too late to repent. Near the end of the third and final chapter of his book, Brother Toscano provides "a blueprint for Zion." For those of us who still hold out hope, this plan follows the requirements the Lord would have us follow. Whatever you want to call the growing awakening taking place within the church today, Toscano must certainly be considered the grandfather of the movement. As former Associate Editor at the Ensign magazine, Paul Toscano was the first prominent church member back in the early '90s to recognize things were slipping. (Paul is probably best known for his influential essay entitled All Is Not Well In Zion: False Teachings of the True Church, which you can read for free here.) We would all do well to consider his proposals as to what we as individuals can do to bring about Zion in our own lives without waiting for the institutional Church to come around. Remember, Zion is not a Church; it isn't necessarily even a place. Zion is "the pure in heart." We need not wait around for official instructions. We already have them in our scriptures. 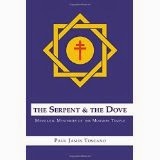 The Serpent and the Dove is essential reading. I don't usually insist this adamantly that my readers buy a specific book (unless it's mine, of course! ), but believe me when I tell you, you need to get this book, and you need to get it now. 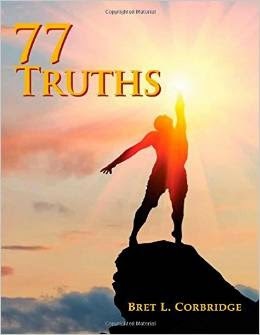 While Paul Toscano's book is the size of a small handbook at a mere .3 of an inch thick, Bret Corbridge's 77 Truths has the heft of a big city White Pages. For those seeking a comprehensive guide to the essential doctrines of our faith, this is the absolute best one volume reference I know of (and I own a lot of Church reference books). Most importantly, it will walk you through the steps necessary to contribute to a Zion society. Laid out under 77 key principles of the gospel, this book contains all the scriptures and statements of the prophets you will ever need to assist you in following the Savior's will. It's divided into 77 separate sections, each section with its own header statement outlining a single doctrinal principal or "truth." This is followed in each instance by several pages of scriptures, analysis, and quotations to back up and thoroughly explain that principle. This book has already become my chief gospel reference of late; when I'm looking for a needed scripture or quotation, this is now the source I now go to first. But a reference book is not even its intended first use. This book is designed to be used as a sort of "Gospel Textbook," starting at the front and working your way through one principle at a time. It's ideal for family night teaching, or daily or weekly devotionals, or even as a couple's study. And if you're like me and slept through all four years of Seminary, this book is your second chance to get that Gospel G.E.D. *However, the edition of the Book of Mormon I would want to bring with me would be Daymon Smith's The Abridging Works: The Epic and Historic Book of Mormon Arranged in Sequence of Composition, which is far superior to the one in my Triple Combination. 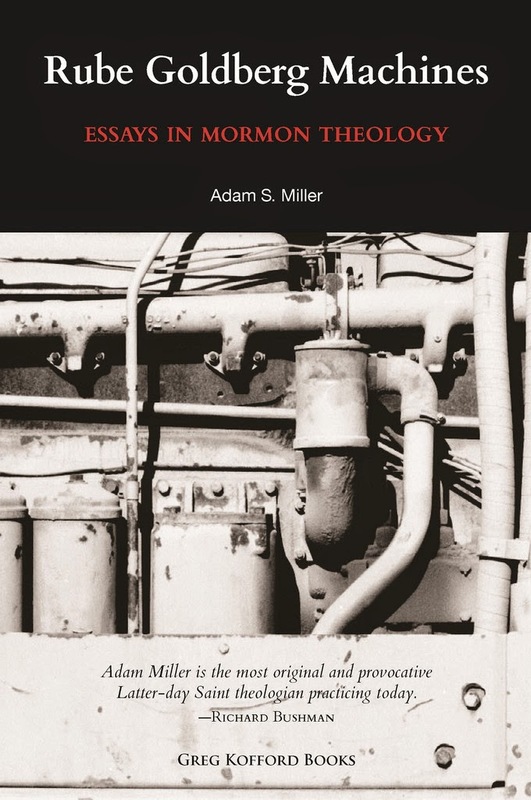 At the beginning of this piece I said I was going to recommend two books on Mormon Theology, but a third book has just crossed my desk which begs to be included here, since it covers the doctrine surrounding a topic that a great majority of latter-day Saints are woefully ignorant about. 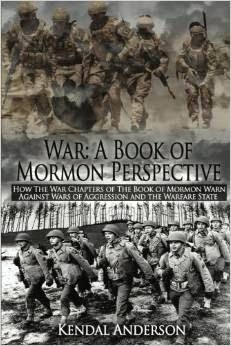 The book is War: A Book Of Mormon Perspective, by Kendal Anderson. I have spent only a few minutes skimming through the pages thus far, but it looks like a very promising read, and a much needed antidote to the false teachings so prevalent throughout the church today. Long-time readers may recall that last Memorial day I nearly gave myself an aneurism after watching an official Church video that completely misrepresented the Lord's teachings on war, and had this book been available then, I might have shut up and just told you to read this book. War: A Book of Mormon Perspective is not the first book to address this important topic, but it is the most comprehensive. Three years ago, War and Peace In Our Time: Mormon Perspectives was favorably reviewed by me here, and although I recommend it, this recent publication seems to hold the promise of providing more accurate and comprehensive theology on the topic overall. The final third of the book contains two sections of apendices, and like Corbridge and Toscano's books, this one is heavily footnoted. 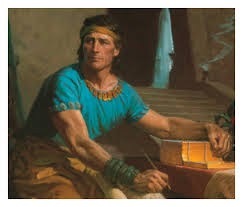 As Anderson reminds us in his chapter on the misunderstood Captain Moroni, Warfare is the number two theme in the entire Book of Mormon, and since it is both the most important and the most ignored doctrinal issue of our day, it would behoove us to make certain we are on the Lord's side on this before we thoughtlessly jump into battle. As first announced last month, plans are being made for a Remnant Family Reunion to be held in May on Colorado's Grand Mesa, about a five hour drive from Salt Lake City. This will be a FREE opportunity to gather and get to know like-minded latter-day Saints. I'm happy to announce that the venues have been obtained and all details have been hammered out, so if the Lord inspires you to come join us, I hope you will. I'm very excited to meet many of you in person. If you are at all considering joining us, please hie over to Adrian Larsen's website, To The Remnant right now, and click on the flyer to download the pdf file where you'll find the schedule, maps, information, and places you can buy your groceries for the potluck meal. And remember, this event is FREE. I hope to see you there! Rules For Commening: I again remind those who wish to comment that posting only as "Anonymous" has not been working for us. You do not have to use your real name, but if you insist on choosing "Anonymous" from the drop-down menu, you must invent a username and place that either at the top or bottom of your comment so that readers can tell you apart from the many others who for some reason keep choosing to post under the "anonymous" option. If you have a Google registration, use that one, otherwise it's best if you check the box that says "Name/URL", place your preferred username in in the "name" box, and ignore the box that asks for a URL. That way you can still remain anonymous if you so wish, but then other readers have a handle to address you with when responding. Comments missing any kind of identifying moniker are at risk of being deleted. I have to be strict about this because too many people posting as "anonymous" has resulted in chaos in the past. I had every intention of devoting this space to a discussion of some new tools available that would be of benefit to all of us in better understanding our religion, but I think I'll put that off for now in order to address a brewing controversy. In last month's comment section, a vigorous debate has ensued regarding what one reader considers my refusal to correct a factual error in my book "What To Expect When You're Excommunicated." This controversy erupted into a vigorous debate between that reader, who goes by the username "Robin Hood," and another regular, whose online handle is "Log." Circumstances forced me to be absent from monitoring my blog for a couple of days, and when I returned I was dismayed to see the conversation between these two bordering on the acidic. The primary reason for my dismay was because, outside the pages of this blog I consider both of these readers personal friends of mine. I have engaged in discussions with both Log and Robin Hood on several occasions outside of this forum, and even met with one of them when he came through Sacramento for a visit. And though on occasion I have had disagreements with both these men, more often than not we have found common ground, and not allowed differences of opinion to color our friendships. So I wasn't keen on seeing these two go after each other with what looked to be increasing acrimony. I was going to weigh in on this matter there in the comment section, but then realized this was a topic that warranted being addressed generally, because it concerns an issue I wish to bring to the forefront. Not everyone reads the comment sections, after all, and since many of you have been wondering whatever happened to the threat of excommunication that has been hanging over me since last May, addressing this topic also provides an opportunity to catch everyone up to date on that situation. The present controversy began because now and then someone will accuse me of teaching falsehoods on this forum, as was the case with a recent commenter named Matt, who appeared in the November comment section to declare, "I can't believe so many of you support the false doctrine that this blogger posts." Matt proceeded to weigh in with additional comments, none of which zeroed in on what exactly I had written that he considered undoctrinal. Finally I wrote back and told Matt that if he would kindly point out the particular false doctrine he was concerned about, I would go back into the article and either delete or correct what I had written. It has always been my policy to correct any errors I might have let slip, whether the error is doctrinal or historical, as I don't wish to use this blog to promote falsehoods. Matt never responded to that request, and as of this writing, I'm still waiting for him to return and tell me exactly what the false doctrine was that got him so worked up. Because until he brings that actual mistake to my attention, I won't know how to make it right. 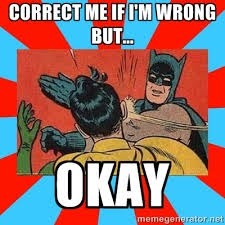 More recently this topic came up again when I told another reader it was my policy to immediately correct errors on this blog when errors are pointed out to me. That's when my friend Robin Hood weighed in to remind me that he had brought an error to my attention months ago in a personal correspondence with me which I had not yet corrected. The reason I did not fix the error, as I told him at the time, was I didn't feel it was an error. Robin Hood wrote me privately to inform me that an Area Seventy is not a general authority. General authorities, he said, are considered the First Presidency, The Quorum of the Twelve Apostles, and the First and Second Quorum of the Seventies headquartered in Salt Lake City. Other Quorums of the Seventy are not considered General Authorities of the Church, he insisted, but are "area authorities." So I did a bit of research to learn about the function of these area seventies to see if my friend was correct. At the time my bishop had informed me one of these guys had ratted me out, I hadn't even been aware of the office of Area Seventy. I was aware there were two quorums of the Seventy operating out of Salt Lake City, but I was frankly surprised when my bishop told me there were eight or nine quorums total (he was not certain which quorum our Area Seventy belonged to, but thought it might be the eighth). According to my subsequent studies, the First Quorum of Seventy is located in Salt Lake City, and all other quorums (including the second), operate today as appendages to that quorum, and are spread out over North America and the globe. I told Robin Hood that I had checked with Hans Mattson, who until recently had been an Area Seventy over much of Europe, and that Mattson had confirmed to me that "a Seventy is a Seventy," that they do not institute policy, but "operate under the direction of the Twelve." This is another thing that didn't sit well with Robin Hood, who felt Hans Mattson was not a credible source because, according to Robin Hood, Hans Mattson is "a known apostate." I disagree with you on your accusation that Hans Mattson is an apostate. I don't see where he has apostatized. As Area Seventy, the Stake Presidents under him constantly came to him with questions the members were having regarding certain truth claims of the Church that he could not answer. Eventually a couple of reps from Salt Lake came out and met with Mattson and these leaders, ostensibly with the goal of answering their questions. One of these men (I don't recall who the other was, but one of them was Church Historian Richard Turley) pointed to his briefcase and said something to the effect of "if you could see what we have in this briefcase, all your doubts would disappear." But they never showed them what was in the briefcase, and the answers they gave to the member's concerns were evasive and non-responsive. Mattson eventually resigned his position as Area Seventy because he did not feel he could fulfill the responsibilities given the doubts he now had. My personal opinion is that the Church leadership failed to provide him sufficient backup. But I don't see how that makes him an apostate. He didn't turn his back on his basic beliefs as far as I remember. He appears hurt and disappointed that he was left with no support. I am seriously bothered by the cavalier manner in which accusations of apostasy are thrown about today toward anyone who has serious concerns about how this Church is currently being managed. Actual apostasy is a serious thing, and we should be very careful about using that label on people we have disagreements with. John C. Bennett was an apostate. His defamation of the prophet cost real people their lives, including ultimately those of Joseph and Hyrum Smith. Hans Mattson was a sincere seeker of truth. That those in authority over him failed to provide him with answers to his questions does not make him an apostate. 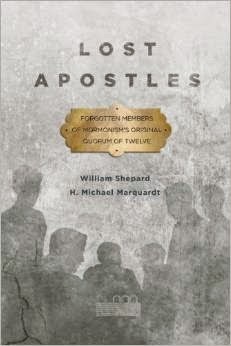 "The idea here, as collaborated in the scriptures, is that apostasy is the mindful departure from the gospel. The Nehors and those who rejected the church in the time of Alma were cited for their dissent from the gospel. Robin Hood's rejection of Brother Mattson's job description merely because Robin Hood considers Mattson an apostate is irrelevant. Compare Mattson's actions with those of William Binney, who until recently was the Technical Director of the NSA and America's top code breaker. Binney did not resign from the NSA because he had suddenly turned his back on America. He resigned because his experience in that position of authority had convinced him that the federal government had gone rogue. We do not ignore William Binney now that he has resigned from government service; rather we recognize he has something important to say. Likewise, Hans Mattson was unimpressed with what he saw as a lack of transparency at the top of the Church hierarchy. He did not, as a result, turn his back on the gospel of Christ. Yet Robin Hood uses Mattson's resignation as proof that he is not qualified to tell us what his duties had been when he was an acting Area Seventy. In my opinion, that argument doesn't wash. I maintain that if we are to glean an answer to our question, we must not wander off point and engage in name calling. Is an Area Seventy a general authority of the Church, or is he not? That is the question. Robin Hood says no, that an Area Authority is merely a regional authority. My research tells me differently. According to the section on "Quorums of the Seventy" in Priesthood and Church Organization edited by Daniel H. Ludlow, "...he is ordained a Seventy and set apart by the First Presidency of the Church, receiving the authorities and powers that pertain to his calling as a general authority." That section appears to be referring to all quorums of the Seventy. Well now. The Encyclopedia of Mormonism was compiled and published under the supervision of the Church, and LDS.Org is considered the current authority on all things Mormon. Yet their definitions contradict each other. Log refers to the Church's "sliding definition of Seventy." I think that's an apt description. But I don't wish to quibble, so I hereby declare both Log and Robin Hood to be the winners in this debate. Because after giving it my best effort to learn the facts, I have to admit I just don't know. Want to know my conclusion? The entire history of the office of the Seventy is one indecipherable mess. I mean one confusing, convoluted, Gordian knot, holy hell of a mess! From the pioneer days on, it seems the Church didn't know what to do with these guys. All I knew about Seventies before this was that while I was growing up in the church, most wards had a quorum of these guys who met during priesthood, just like the Elders and High Priests today. Then suddenly one day it was announced that the Seventies quorums within the wards would be disbanded, and that instead the Seventies would consist of a smaller group with limited authority operating within the hierarchy at Salt Lake. Well, there's your first clue. It's a tale as old as time: men with supposed authority jealous to protect their status. Today we can argue about whether one brand of Seventy counts as being an official bigwig or not, but the larger question that should concern us is this: whatever happened to the division of power within the Church? I realize I often beat this topic to death, but the Lord never intended His church to be structured from the top down. The First Presidency, Apostles, and Seventies were to operate independently of one another, with no group having seniority over the other. This system of checks and balances was not copied from the men who founded our constitution. On the contrary, America's founders got their idea of separation of powers from observing the law of Moses. Sadly, today we take it for granted that the the president of the Church is the Big Kahuna over us all, with the Twelve Apostles operating under him as a kind of board of directors for the corporation. The Seventies have been reduced to little more than lackeys who exist to take orders from the Twelve. If you don't believe me, dip into Malcolm Jeppsen's disturbing memoir of his years acting as willing lapdog to apostle Boyd K. Packer. The important thing to be concerned about here is not the relative ranking of Seventies within the Church, but whether any Seventy is authorized to reach into the internal affairs within a stake and order stake presidents to discipline individual members. As I documented in a prior post, they decidedly do not. And as it happens in my case, there's a possibility no such overreach actually took place. As I wrote on both this blog and in my book, my bishop was very clear when informing me that an Area Seventy, whom he named, had given instructions that I be disciplined if I failed to obey the ultimatum I was given. Since this bishop and I are friends, he told me he had not wanted to be the one to deliver this ultimatum to me, but told the stake president that since I'm a Melchizedek priesthood holder, I was under jurisdiction of the stake president, so the stake president should be the one to call me in. The stake president responded that I was in the bishop's ward, so the bishop got the short straw and that's how I was informed that an Area Seventy had read parts of my blog and given orders that I had to either comply or go. This is the information as I understood it, as it was related to me by my bishop last May. Since I neither resigned nor ceased to blog, I finally got a chance to meet with the stake president the following September. It was a cordial visit, but lasted two hours and our conversation was too lengthy and involved to go into here. Suffice it to say by the end of the meeting, he understood me, even if he didn't "get" me. He understood that my testimony of the Book of Mormon, of Christ, and of the gospel as restored through Joseph Smith was unassailable. What he didn't get was why anyone would want to retain membership in this church if he didn't express fealty to Church leadership. "if you don't believe that they are who they say they are, where will you go? Do you have another church or restoration you are looking for?" That's a strange question. But like I say, it's symptomatic of the disease now rampant within the church that assumes the leadership of the Church somehow is the church. I spent almost ten years working for the Walt Disney Company after the death of its founder. I and many others eventually grew dissatisfied with the current management, which we felt was operating contrary to the designs of the founder. It was eventually suggested that if we didn't like the way the current management was running things, we could leave and go somewhere else. And you know what? They were right. We were mere employees of the corporation. We had no say in how it was to be run. Walt Disney's own adult daughters could not dictate company policy, because Walt Disney himself had never been the owner of the company; he only ran it while he was living. Disneyland was not a family business. And now, when I remained there in the late 1970's, there was new management in town, and they were absolutely in their rights to run the company to their liking. Even if they ran the company into the ground (and for awhile it appeared they might do just that), it was none of the business of us salaried employees, no matter how much we loved what it had stood for previously. The company belonged to the current stockholders and their managers, not to us peons. But a church is not a business. The church of Jesus Christ does not belong to its managers. This is not the church of Thomas Monson, or Brigham Young, or even Joseph Smith. It is not the Church of the First Presidency or the Twelve Apostles. This is not some brand that can be marketed, owned, and controlled by those at the top. There is a reason there are two possessives in the name of this church: it is the church of Jesus Christ and it's the church of the latter-day saints. This is our church. It doesn't matter who is currently making administrative decisions; the managers are not in charge of the members. We are not in their employ. As much as this point of view puzzled my stake president, a younger man raised his entire life in a closely correlated religion, I believe he was convinced that I am no apostate. But he did tell me something that contradicted the information I had received from my bishop. He told me the ultimatum had not come down through an Area Seventy, but that he, the stake president, had been alerted to my blog by a member of my ward, and the stake president then consulted with the Area Seventy as to how to handle things. If this is true, then that's good news, as only members of a congregation are permitted to initiate disciplinary action against another member. I told him I was happy to hear this, and that he only needs to find one more witness against me before he can move forward. But then he went too far. He told me he was absolutely assured by Church authorities that Denver Snuffer's excommunication had not been orchestrated out of Church headquarters. We know from Denver's own testimony that apostle Russell Nelson personally directed Denver's stake president to expel Denver from the Church, and that the stake president, knowing Denver's character, resisted Nelson's instructions for a year and a half. The intensity with which my stake president tried to get me to believe that members of the hierarchy would never overreach their authority has caused me to wonder if he was on the up-and-up with me regarding my own situation. I don't believe he was fibbing to me about Denver Snuffer's situation. I think he was simply repeating what he had been told. As far as my situation, his story did contradict the version told me by my bishop. A great deal of time had passed since the bishop gave me his report, and in that time I had documented both on my blog and in a book how utterly inappropriate it would be for the authorities in Salt Lake to instruct local leaders to take action against me. My story, and that of others, had been covered by several media outlets, and the possibility that the Church had violated its own scriptures (as it had numerous times in the past) was getting more difficult for the Church's PR department to defend. It would not be unreasonable to expect that some in the hierarchy might see the need to back off and institute damage control. Combine that with this: it is highly unlikely that anyone in my ward was disturbed enough by my writings to report me to the stake president, for the simple fact that almost no one in my current ward has any idea who I am. When Connie and I first moved to this ward in July of 2005, we attended only briefly before Connie's health took a turn for the worse. She could no longer attend her meetings, and I was required at her side to look after her needs. We had not had much opportunity to make any friends in our new ward before we dropped out of sight completely. That was nine years ago. The ward we had moved into was populated mostly by an elderly demographic, and attendance was sparse, to put it kindly. Members were literally dying off by the week. This ward desperately needed new blood, and while we were absent, it got a powerful infusion. A neighboring ward full of young families was moved into our chapel and combined with our anemic one. By the time I was able to get away from caring for Connie and resume attending, which was five months after disappearing, I found I recognized very few faces. The one friend I thought I had in the ward was actually surprised to see me. "I thought you moved away," he said. It would be accurate to say we had not been missed. So I'm a bit skeptical to hear that a member of my ward knew me as the proprietor of the Pure Mormonism blog and was upset enough about it to complain. Even the member of the bishopric who called to tell me the bishop would like to meet with me did not know about my blog or who I was. I have no way of knowing for certain, but knowing as I do how often the Church hierarchy has interfered in stake business in this manner, I think it's more likely that the report I initially got from my bishop was the more accurate one. On the other hand, the stake president told me in that meeting that he has no immediate desire to expel me. I believe he was sincere. But it may not be up to him, and my writings are being monitored, so we'll see what happens down the road. As for correcting that "mistake" in my book, I'm still not convinced it's in error, seeing as how even the Church's publications can't decide what the office of Seventy means. Still, there are four or five typos I've been meaning to correct (mostly minor misspellings in the tiny footnotes), and if I ever stop being lazy and get around to correcting them, I'll also delete the phrase "general authority" where it appears in connection to Area Seventy. You're welcome, Robin Hood. Now you and Log go kiss and make up.